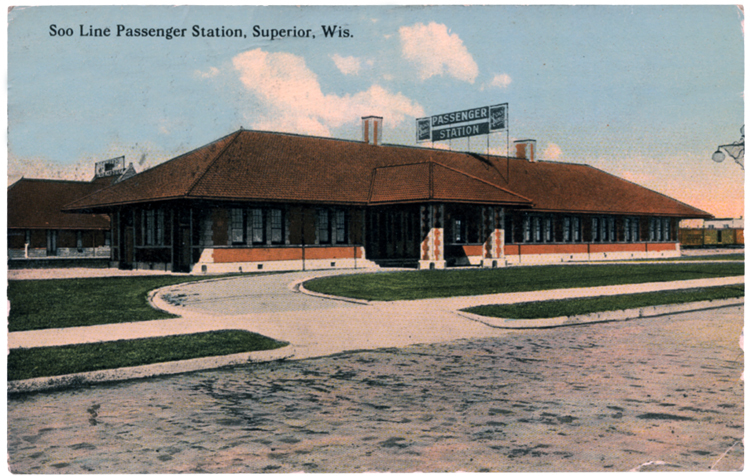 When the Wisconsin Central Railroad had a passenger depot built in Superior in 1908, it included a freight station, store houses, a machine shop, and even a roundhouse. In 1909 the St. Paul, Minneapolis & Sault Ste. Marie Railroad, known as the “Soo Line,” purchased Wisconsin Central’s outstanding capital stock, essentially taking over the railroad and its assets—and the Superior passenger station along with it. The Soo Line still operates, but it has not offered passenger service through Superior (or Duluth) since 1967. The station was used as a freight depot until it closed in 1989. In 1993 the Soo Line Station was used in the Disney film Iron Will, much of which was shot in Duluth; the building has been converted into retail shops.